Super Scribblenauts is far superior than its predecessor which was quite a unique game. 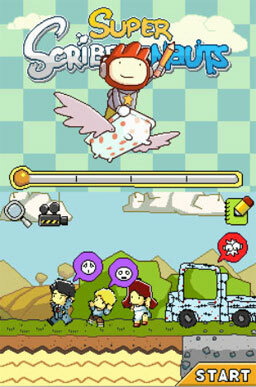 Even though many elements of the original game remain, the developers have streamlined the interface which in turn fixed a few of the bugs and annoyances of the first Scribblenauts. Then you have the all new adjective system which contains over 10,000 adjectives that allows you to create some truly bizarre creatures and items. Another standout feature of Super Scribblenauts is the difficulty which is more challenging than the first game but bare in mind, this game was still created for the younger gamer. 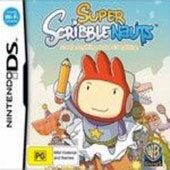 In terms of story, the hero Super Scribblenauts is Max whose prowess is only limited by the players imagination and your goal is to play through a variety of levels (120 to be precise) with a healthy amount of puzzles to solve in order to capture the Starite. Simple hey? Sometimes! But still a healthy challenge and then you have the level editor on top of all this as well. Gameplay is a combination of arcade platformer meets the world of word puzzles which is an interesting mix that actually works. One issue with the original was that jetpacks could solve most puzzles and thankfully this has been rectified with the sequel. No longer is there an easy way out... now you need to think a little harder. The new adjective system works quite well and best of all, this interacts with the environment more fluently. By thinking of certain words to use, this will help Max out of his current predicament and some solutions can be quite amusing to play out. Zombies, Pears and Dinosaurs? They are all available in Super Scribblenauts! Real world physics are also more important than the original game which keeps things a little more grounded in this universe. The control system of Max has also been improved as is the interaction with the gaming world. The stylus is an imperative part of the game, especially with the adjective gaming system and it works quite well with the D-Pad. Controlling max works well with the D-pad or for old schoolers, the stylus is still available. Either way, it works quite well. As mentioned, the difficulty of Super Scribblenauts is more challenging, however hints are available to be purchased through the in-game money. If you are stuck on a level too long, the game will disclose the hint to the player for free in order to assist them move on. This is a clever idea that more developers should se for all games. Just be careful not to spend all your Ollar's at once though. Graphically, Super Scribblenauts isn't the nicest looking game on the Nintendo DS and the characters are quite LEGO-like in experience due to the sprite based graphics. For a third party game, it's still quite colourful and well designed and the animation is a treat to watch. The music is quite ambient as are the sound effects that go well with the gameplay. 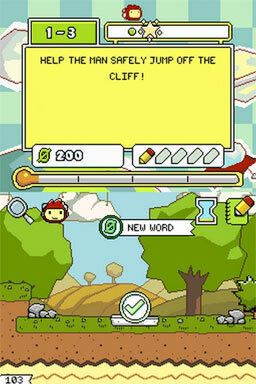 In conclusion, Super Scribblenauts is a very clever game that challenges the status quo of gaming on the Nintendo DS. 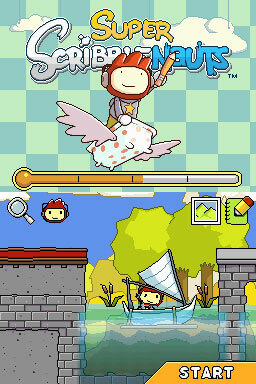 As opposed to the dribble ware that plagues the Nintendo DS, Super Scribblenauts is a breath of fresh air. It's a very surreal game that targets the younger gamer well and dare I say it... even older gamers may get a few things out of this innovative title. Definitely check it out for your kid and if they get bored of it, it's time to jump in for the older gamer. Good times to be had by all!